Use a brush pen to take your script writing to the next level. 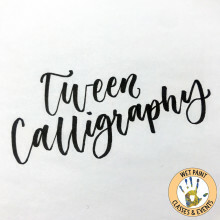 We’ll be learning calligraphy basics which include letter shapes, the lower-case alphabet, and some connecting letters. We’ll be working with brush pens perfect for young beginners.